Let me start by saying that I love Hanoi. The Vietnamese people are beautiful on many levels and the culture in Vietnam is a welcome embrace, so different from our own. Geographically it is a majestic dichotomy of tropical lowlands, rolling hills and densely forested highlands. However, when it comes to traffic control and driving in general a few suggestive instructions may be required. I have driven or been driven in many countries in this big wide world of ours; from Ecuador in South America to most every country in Western Europe, but I discovered I was really missing something until a recent trip to Vietnam. In other countries there have been commonalities like speed, ignorance and refusal to regard anything remotely resembling a traffic law that are the cause of panic, fear and night sweats upon recollection. But in Vietnam it was different. The speed was less of an issue because I don’t think we ever got above 40 kilometres per hour, even on the highways, but there just seemed to be a blatant disregard for, well, everything. In Quito, Ecuador I recall sitting in the back of a cab with my wife flying down hills and through red lights at 120 kilometres per hour in the middle of the city. In Holland I remember driving for hours looking for street names only to discover they were written on curbs and on the streets themselves. In Hanoi, Vietnam these things are not issues, they don’t come into play at all; there are very few traffic lights, red or otherwise and if there are street names it doesn’t matter because they are surely not something that you are going to recognize or even pronounce. The dictionary defines traffic as follows: the movement of vehicles, persons, etc., in an area, along a street, etc. With that in mind it is only fair that I refer to traffic in Hanoi as being astronomical or logarithmic or traffic to the nth degree. In a city of 6 and a half million people there are millions of motorcycles ranging from Vespa-type scooters to small 125cc cycles. Many of these have appeared in the last ten years when the bicycle was passed over in favour of this more comfortable and efficient mode of transportation. It is a frightening scene to look up as a pedestrian and see a wave of thousands of motorcycles advancing toward you, more than half of them piloted by dark-eyed people wearing face masks. You find yourself instantly surrounded and you are lost in a sea of noisy, honking masses of metal and your only thought is “Get me outta here!” It’s disconcerting at first but as time passes you do attain a comfort level that presupposes the cyclists will not deliberately run you down. 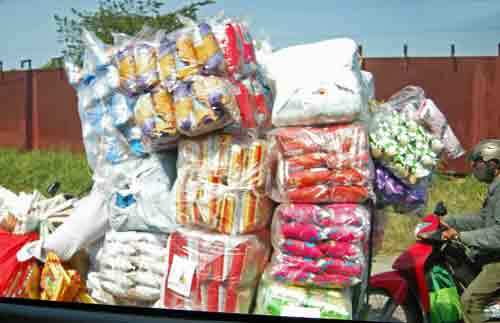 That realization with a little bit of give and take on your part will allow you to navigate unscathed across this rushing torrent of vehicles. They move in masses of fumes and noise, constantly honking and weaving to avoid hitting one another and any helpless sole that wanders out into their midst. 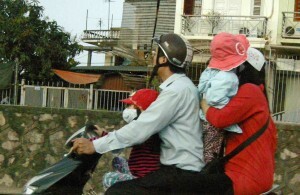 The drivers wear helmets but few of the passengers are afforded this luxury, sadly even the little ones. Children of all ages are crammed onto these bikes, sitting, standing and clinging on for dear life. 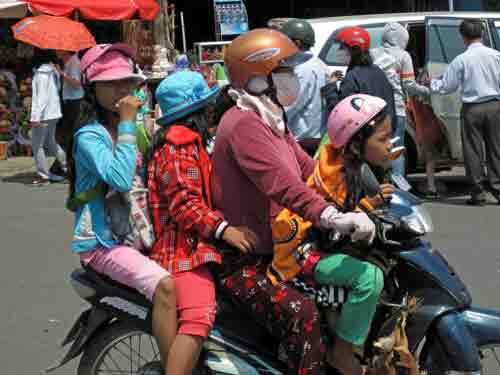 There is no limit to the number of passengers and because almost none of them wear helmets it is a disaster waiting to happen. 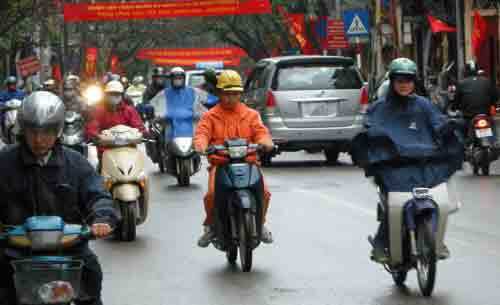 There are no laws to speak of; traffic in general seems to be devoid of regulation of any kind in Hanoi. There are no stop signs and only one or two traffic lights in the entire city – probably just as well, I have a feeling they would be merely decoration if they did exist. I got a great deal of pleasure out of watching then ultimately attempting crossing the street in this perpetual moving mass of machinery. By far the most fun we had was taking an early supper at about 4PM. At the far side of Hoan Kiem Lake from the bridge is a horrendously busy roundabout surrounded by shops, restaurants and cafes. We selected a 2nd floor café so we could watch the now rush hour traffic from above; this daily urban activity had now become a floor show for us. Vehicles and pedestrians maneuvered in every conceivable direction setting up the Vietnamese version of the old video game Frogger – live! What was meant to be a quiet pizza and Coke turned out to be a constant drone of motorcycles and an avalanche of blaring horns. It was obvious that school had just been let out as all of a sudden nearly every motorcycle had a young child or two sandwiched in between mom and dad; once again both ma and pa wore helmets but because the law does not require it until the age of 18 the children did not. Is this a devastating attempt at population control? The road to Halong Bay seemed just a rural variation of Hanoi. There was not a lot of open country but there was some and it was primarily occupied by rice fields, otherwise it was just one little town after another. I don’t know what the speed limit was but it’s 180 kilometres from Hanoi to Halong Bay and it took us a little over 4 hours to get there; I guess I could do the math on that speed limit thing after all couldn’t I? The roads are two lanes wide with a paved shoulder on either side but that does not necessarily mean that they carry two-way traffic evenly. At times all four lanes were occupied by oncoming cars, trucks, buses, motorcycles and bicycles, all honking like madmen at one another. Face masks seem to be the accessory of choice for most; motorcycle and bike riders, all toll booth attendants and the workers in the fields were all battling to get a breath of filtered air in this vehicular polluted mayhem. The drive continued to be very noisy, not to mention more than a little bit nerve-wracking. The procedure is to honk your horn to warn everyone within earshot that you are coming through. The process is not always understood as many times the other drivers and motorcyclists either do not hear or do not heed these warnings; at any rate, they don’t always move, they just keep coming, the blaring horns making it a very scary ride as one head on collision after another is avoided by the narrowest of margins, and yet, through all this, we saw no accidents. 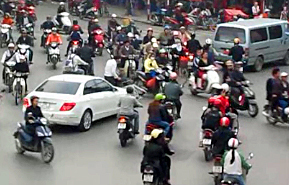 The Vietnamese put more passengers and cargo on their motorcycles than most North Americans load into a pickup truck. On our drive to the airport we were treated to a marvelous cross section of what this entails; from the simplest form, that being the lone woman on a bicycle, to a brightly dressed couple clashing with an equally colourful brick mosaic on a building beside them, to a man carrying a refrigerator, and not a small bar fridge, on his back seat, to a young family of four riding merrily along with the tiniest children standing between mom and dad and neither of Vietnam’s future wearing a helmet to, finally, a fully masked young woman carrying about 800 rolls of toilet paper on her back seat. Please, they are not freight carriers. The motorcycle as we know it was designed as a mode of transportation and recreation to be enjoyed by a maximum of two people not four or five. Traffic laws in general are for control and flow of vehicles and the safety of all involved. They are designed to make the driving experience more enjoyment than challenge – and please, a helmet goes a long way when you run into another cyclist at two kilometres per hour. More by this author in his book ‘Then there Was One‘.